Vladimir Putin. 3rd CISM World Military Winter Games. Putin.BLOG Sports Vladimir Putin. 3rd CISM World Military Winter Games. Vladimir Putin met with leaders of the International Military Sports Council and heads of delegations of countries participating in the 3rd CISM World Military Winter Games. The 3rd CISM World Military Winter Games, to be held in Sochi on February 24–28, will involve over 400 military service personnel from 26 countries. 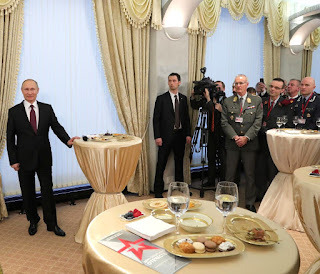 I would like to sincerely welcome our guests and friends, and to thank you for taking the decision to come to Russia to take part in the 3rd World Military Winter Games. This is a remarkable event, as it enhances trust in such a paramount area as military cooperation. It is very important that people in your profession should see each other not through the aiming sight of military and combat equipment, but at sports venues, thus strengthening the friendship between one another. I hope you will enjoy your time in Russia in general, and in Sochi, a city where we have created a wonderful sports infrastructure. We shall do everything we can for you to feel at home, to feel comfortable, and I assure you that we will create excellent conditions for all the competitors to reveal their best qualities. Allow me to wish good luck to you and to all the participants in the competitions. Welcome! And, as you know, today is a holiday in our country, Defender of the Fatherland Day. This is a day when we acknowledge the achievements of our Armed Forces, Army and Navy. Now, as you might know, we are holding an event here in the Kremlin which will be followed by a concert. Let me also send my best wishes to the personnel of your armed forces, the armies of the countries you represent. As the President of CISM, an organization representing 136 countries of the world, I would like to express our appreciation and thanks to your great country and to you personally for hosting the 3rd CISM World Winter Games. It is my tremendous privilege to be here today, Mr. President, to present very great countries with me here from around the world, and to say thanks to you personally and to appreciate your great efforts to host this CISM event in the city of Sochi. Mr. President, it is my pleasure, I am very happy to say that the military athletes of the Russian Federation represent their country very well, giving a very great example to the military athletes around the world. In the field of sport, not only at the military side, but also at the civilian side: we can see at the last Military World Games Russian athletes came at the top, and military athletes during the last Olympic Games in Rio I saw doing a very great job there. Most of the Olympic champions are military athletes. Your Excellency, Mr. President, you have very amazing cooperation between the Ministry of Sport and the Armed Forces. We studied this kind of system that produces very professional athletes. To conclude my speech, last time I saw you in Vladimir city, I loved your words and your speech. It was during the International Sport Forum, and you mentioned, ‘keep sport away from politics’. Your Excellency, today Russia and CISM are doing that with credibility on the ground by hosting the 3rd Winter Games. Today, the Russian Federation and CISM are sending a very clear and important message for the world. Those countries who have credibility should keep politics away from sport. Thank you, Sir, for you vision. I can assure you that your vision has been our principle since 1948. Sir, with your great support, I would also like to thank the Minister of Defense, who gave us support previously, and we have also future plans to support Russian athletes in the future. We will be always with the Russian athletes, not only in the military field, but also on the civilian side. I can assure you that we will maintain our philosophy to promote the peace, and using the sport as a tool for promoting friendship among all these great countries. With your great and powerful country, of course, we can achieve a lot of goals. Thank you very much, Sir. 0 Comment to "Vladimir Putin. 3rd CISM World Military Winter Games."